Velvet Green Creations is based in the State of Michigan with our office situated in the heart of the Upper Peninsula. Our Michigan location south of the Tahquamenon Falls, gives us the serenity and inspiration needed to be your Michigan Web Designers. Velvet Green Creations has been providing our web design services since 1998. Lifelong residents of both the Upper and Lower Michigan, the Velvet Green Team has the understanding and marketing experience to help your business or organization succeed. 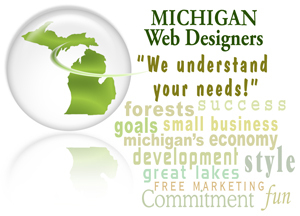 When searching for Michigan Web Designers, it is imperitive to explore your possiblities, choose a company that can define your strengths and unique qualities, and most of all - provide that strong Michigan Web Design Marketing that you need! As Michigan Web Designers, we help design your website based on your products, services, location, and what makes you unique to your competitors. We work with organizations, large corporations, small businesses, individuals, non-profits, and entreprenuers throughout the state of Michigan and beyond. Please visit our Featured Websites page and our Portfolio to view some of our creations. Velvet Green Creations owns 4 web directories that provide a "Power House" of marketing for all of our clients. These services are FREE for clients who host with us. This has become an invaluable tool that helps clients succeed on the internet. Remember, you don't only want to look good - you want to be found! Velvet Green Creations Web Design Team can give you the internet strength that you and your business deserves!